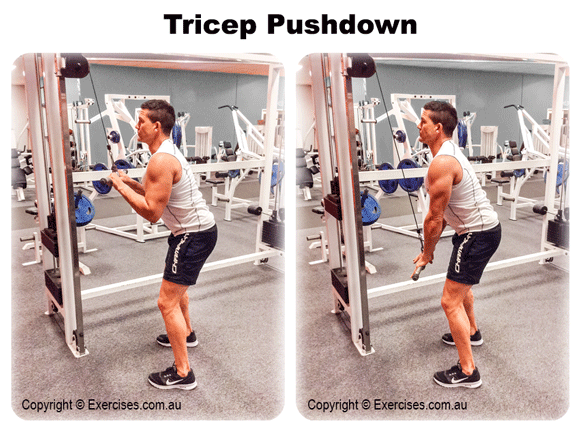 Tricep pushdown is an excellent isolation exercise to both pump up and shape the triceps. 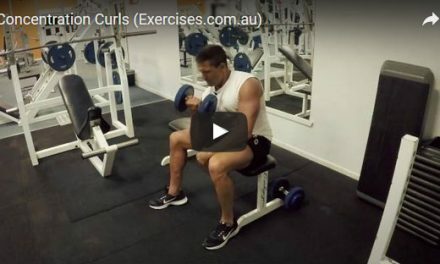 This exercise is ideal to warm up the elbow joint before pressing movements as well as a great finisher to any arms workout. Grab a straight bar and attach it to a high cable pulley at least at chest height. Grasp the bar with both hands and bring it down until upper arms and forearms are at 75-90 degrees. Contract the triceps and press the bar down towards the ground and back towards the body in an arch-like motion. Remember to keep the upper arms stationary throughout the movement. Also be sure to keep the upper arms close to the body, elbows slightly behind the body if possible.